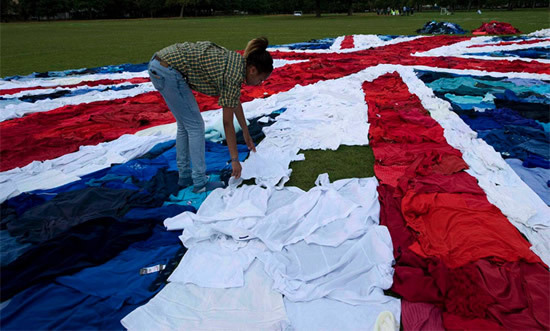 The 2012 London Olympics was truly honored with Marks & Spencer as well as Oxfam teaming up to create the world’s largest “Union Jack” from unwanted clothing. The 65 foot long ‘cloths mosaic” comprising of nearly 2,100 red, white and blue garments, was unfurled at West Ham Park in East London. The department store’s “Shwooping” initiative which is a part of a UK wide clothing recycling program, encourages shoppers to surrender an unwanted piece of clothing for every new one they purchase. Abu Dhabi, the capital and the second largest city of the United Arab Emirates, could pretty much turn into one of the world’s greenest cities with its continuous overhaul of green. 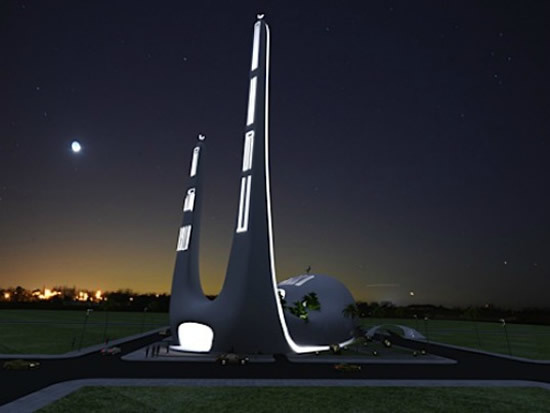 Just recently, the city accepted designer Suhail Mohammed Suleiman’s proposal for a one-of-a-kind contemporary mosque. Sustainable and eco-efficient, this mosque uses solar power generated from on-site solar panels and uses a system that captures and recycles water used for ritual washing which in turn is used to irrigate the greenery around. Sporting a green roof, this mosque design has been awarded a Five Pearl Rating from the Abu Dhabi Urban Planning Council and also sports two crescent-topped spires that point towards the holy city of Mecca. We’ve featured artist-designer Bruce Munro’s fabulous works before, including a cascading installation made from recycled CDs. 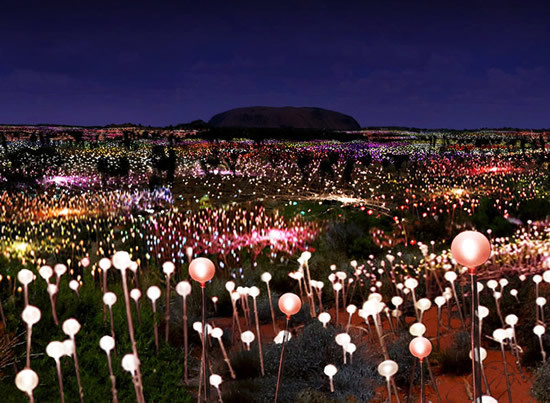 The artist, knowing for creating seriously eye-catching installations, will soon unveil his largest ever created, nestled at Ayer’s Rock, Uluru. Called the Field of Lights, this project will power up completely by solar energy in the heart of the desert and will not use grid connections to light up. While the project is currently in its fundraising stages, the field of light will convert Ayer’s Rock into an aesthetic beauty that encourages observers to turn towards greener sources of energy generation, like solar power for instance. Using 3,290 kilometers of optical fiber and 500 LED solar-powered illuminators; Munro and his team expect the work to be completed in six weeks and will show up by May 2013, remaining on display till October 2013. Marks & Spencer seems adamant of lightening its carbon footprint and has recently unveiled a one-of-a-kind suit, probably the greenest the world as ever seen. 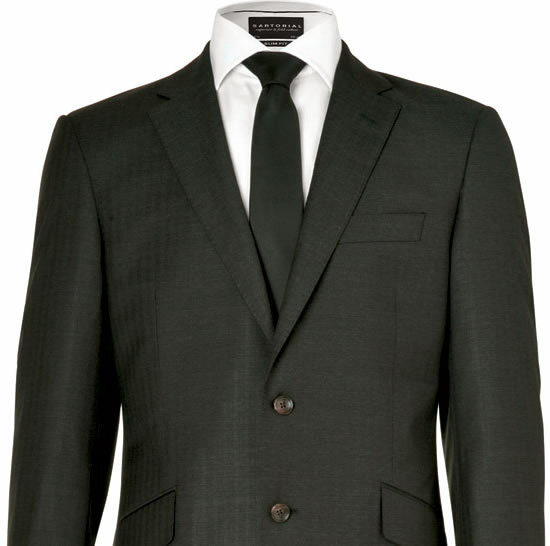 Called the world’s most sustainable suit, this jacket-and-trouser uses Global Organic Textile (GOTS)-certified organic wool; a lining derived from recycled plastic bottles, recycled-polyester canvas interfacing, reclaimed buttons and pockets, a repurposed waistband, and recycled-polyester labels and is well tailored and suave indeed. Priced at £349 ($549), five hundred of these have been manufactured and will hit stores by September, bringing to light Marks & Spencer’s commitment to a carbon-neutral future. The Stonehenge has always been more than just a mysterious arrangement of rocks shifted into place by our ancestors with technology we cannot understand yet. 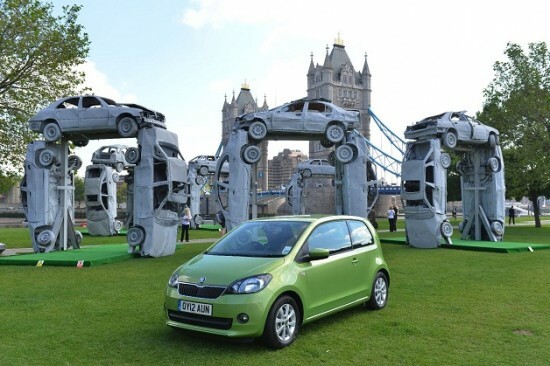 Driving inspiration from this enchanted landmark nestled in the English county of Wiltshire, automobile manufacturer Skoda has come up with an eye-catching way to recycle its old cars. Called the Citihenge, this installation makes use of old cars and took three months to craft and 12 hours to install. Located at the south bank of the Thames near the Tower Bridge, the installation makes use of18 scrapped cars and weighs a total of 36 metric tons. 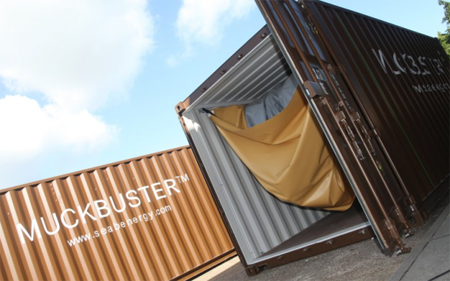 Also, the installation is capable of facing the elements and can withstand a force-12 hurricane! And that’s not all. The Citihenge has been cleverly crafted to make it recyclable once used. Philip Starck’s Broom Chair carved out of recycled industrial waste! 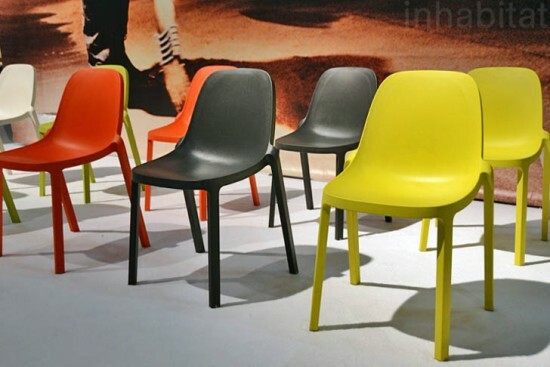 Recycling has taken a new form recently with designer Philip Starck’s latest, a chair made from recycled industrial waste! Called the Broom Chair, this piece of furniture will be show off at the ICFF and uses 90% recycled waste from industrial sources. Previously unveiled at the Milan Furniture Fair, this design was conceived for Emeco and uses discarded wood fibres and reclaimed polypropylene. Using these materials to create a plastic-wood composite, Starck managed to create a comfortably elegant piece of furniture that’s as green and eco-friendly as you’d require a chair to be! Planning to toss those plates of leftovers from yesterday away in the waste? Give this a thought. Leftover food could very well be used to generated energy with technology company SeaB’s newest brainchild, MuckBusters. Basically mobile recycling units nestled in shipping containers, the Brit folks from SeaB are currently trying to gain public interest around the Bay Area. According to claims made, the MuckBusters system can very well generate enough electricity to power up 150 computers from half a ton of unwanted leftover food. McDonalds, the land of burgers and fries usually attributed to obesity is now looking for ways to turn green. To start off with, the golden arched fast food chain will begin using recyclable paper cups in the near future. 2,000 restaurants of the chain making up for 15% of those in the United States alone will begin testing phases, ditching the previously used polystyrene cups for recyclable paper cups. Also, given that these cups are recyclable further ups the green quotient. Composting paper cups leads to the emission of harmful greenhouse gases. Reusing the cups instead helps save o0n paper, resulting on fewer trees being cut down. 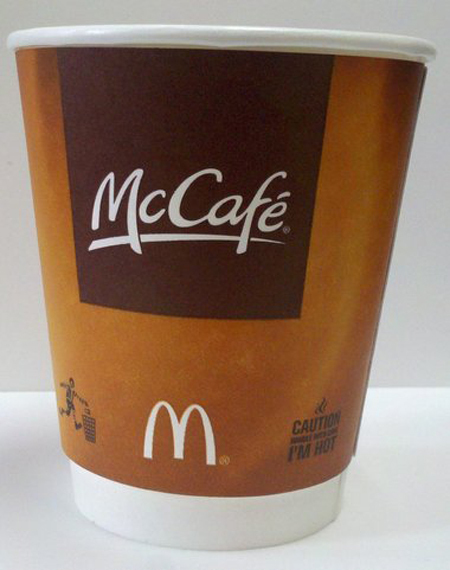 We wish McDonalds on its endeavor and hope to see polystyrene cups completely phased out in the future. Google figured that toilet water doesn’t necessarily need to be flushed down the toilet, literally. Instead, the search engine giant has come up with an eco-friendly way to cool down its data centers, using water from toilets. As insanitary as this sounds, Google has come up with a foolproof plan to use waste water to cool down the western Georgia data center without raising a stench. Google figured the water used to cool down its systems doesn’t really require to be necessarily clean. This indeed is an innovative way to reuse waste water and decrease reliance on grid-connected cooling systems, making this plan put together with Google with help from the Sewer Authority a marvelously green one! 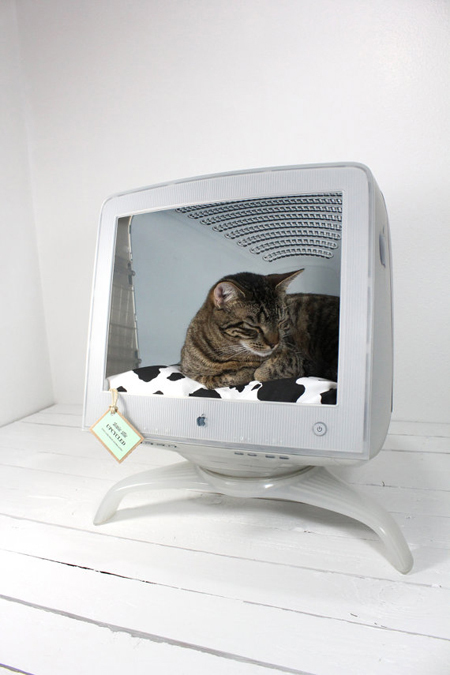 Why trash away an old Mac Studio Apple Computer when you could very well turn it into a cozy adobe for your furry feline friend to sleep in! Called the Upcycled Apple Computer Pet Bed, this hollowed out Mac doubles up as a bed for your kitty. Complete with a triple-stitched removable slipcover and a cushion, this one’s as comfortable as it gets and is assured to have your kitty sleeping soundly. Priced at $129 on Etsy with a $28 shipping charge, this recycled Mac-turned-bed could work as the perfect Valentine’s Day gift for your lovable ball of fur.